With the combined world-wide experience and technology at Doyle Sails, we can provide the most advanced sail designs, construction, cloth selection, and hardware for the durability and comfort of your boat together with any custom canvas work you may need. Doyle Sails in Whangarei is solely owned by Phil Houghton. Phil has been a sailmaker for more than 30 years, and has worked with Doyle Sails NZ since 1994, when he was a partner with Richard Bouzaid after winning the Whitbread with the Yamaha campaign. Phil has a huge amount of experience, sailing in both local and international regattas. As Doyle NZ grew Phil worked as Head of Service and After Sales for 10 years. He then worked on the Sanya Volvo campaign, before moving to Whangarei to help extend Doyle’s national network into Northland New Zealand. 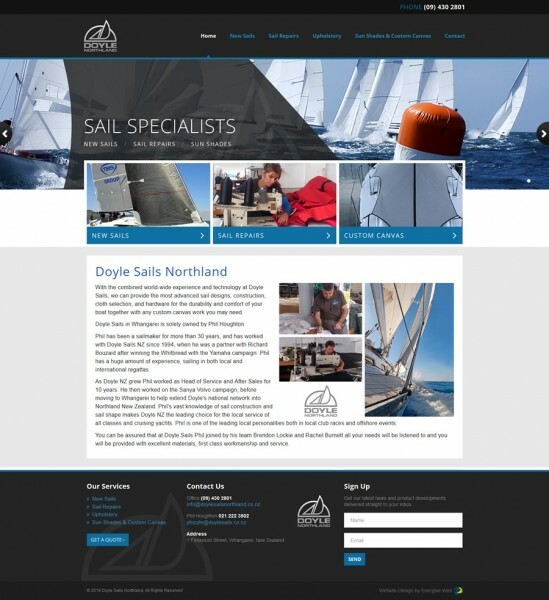 Phil’s vast knowledge of sail construction and sail shape makes Doyle NZ the leading choice for the local service of all classes and cruising yachts. Phil is one of the leading local personalities both in local club races and offshore events. You can be assured that at Doyle Sails Phil joined by his team Brendon Lockie and Rachel Burnett all your needs will be listened to and you will be provided with excellent materials, first class workmanship and service.